The European Commission has approved the takeover bid made by Rupert Murdoch's News Corporation for satellite broadcaster BSkyB. The commission ruled that the takeover would not "significantly impede" competition in Europe. The news came before the revelation that UK Business Secretary Vince Cable had said he planned to block the move to take full control of BSkyB. Mr Cable told undercover reporters that he had "declared war" on Mr Murdoch. His comments - revealed by BBC business editor Robert Peston - came during a conversation with Daily Telegraph reporters posing as members of the public from his Twickenham constituency. As Business Secretary, Mr Cable will have the ultimate say on whether News Corporation's bid for BSkyB can go ahead. In a statement, News Corporation said it was "shocked and dismayed by reports of Mr Cable's comments". "They raise serious questions about fairness and due process," the company added. BSkyB said it would not be commenting on Mr Cable's comments. 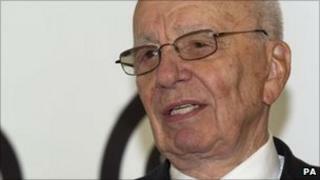 BSkyB rejected an offer from News Corp worth about £12bn in June. Sky's competitors say that a takeover would give News Corp, which owns a host of media outlets including the Times and Sun newspapers, too much power. News Corp said it "welcomed" the commission's decision. A separate investigation by the UK competition authority Ofcom is continuing. Its inquiry is looking into "media plurality" - the degree to which news outlets are concentrated under one organisation's ownership. The commission said its ruling in no way prejudiced Ofcom's investigation. "The UK remains free to decide whether or not to take appropriate measures to protect its legitimate interest in media plurality," it said in a statement. News Corp already owns 39% of BSkyB, and is looking to take full control of the company. News Corp titles, which also include the News of the World newspaper, account for a third of the UK's national newspaper circulation, while BSkyB has almost 10 million customers. As well as its UK interests, News Corp owns other major assets including the Fox film and TV empire, as well as major publishing companies, including Harper Collins.